Living in Nebraska you may know that it is harvesting season. The beautiful green corn stalks are now gone, and have been made into mazes or food. Allergies are typically flaring and we transition into shorter days and crisper air. Fall is a time for harvest. To harvest what we have accomplished this year, and like the leaves, begin to let go of what we no longer need. Take this opportunity to take stock in what you have planted this year. Begin a gentle inward reflection. Fall is a transitional period. It moves us from our hot and active (sometimes chaotic) summers into preparation for a more sedentary, cold winter. Fall feels more like an exhale. The energy of fall is all about change and balance, an invitation to take a moment and slow down. A time to reflect, re-evaluate, and nurture ourselves. 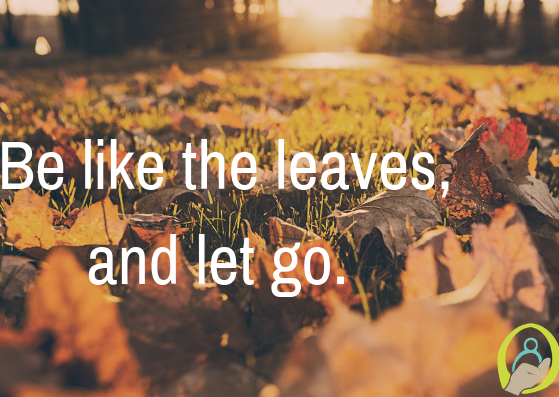 We begin to take from fall, one of our greatest lessons – letting go. The trees leaves transition into beautiful colors and eventually, one by one begin to fall. The tree does not cry or weep over it’s fallen leaves, it knows that the leaves had served it’s purpose and is now time to prepare for winter. Check in on when and where your energy is going – work, relationships, friendships. If these things are not serving you in the way you want or need, change them or let them go. Taking a moment for mindfulness can allow us to declutter our minds and prepare for the art of letting go. Begin this by simply noticing. Notice the beauty in the trees and season of fall. Take a moment to admire the falling of the leaves, the changing of the air and the becoming of winter. As you watch the leaves fall to the ground remind yourself that natures cycles’ are mirrored in our own lives. Here is your permission to release your layers that have been making you heavy. You deserve to be lighter, and free. Letting go is freeing. It allows us to make space for those things that do nourish us, and bring us health and happiness. Now, turn your energy inward and recognize those things that deserve to flourish. “Be like a tree and let the dead leaves drop.”- Rumi.